The Sarah Community was built around a conversation. Five women religious congregations initially came together to identify pressing needs related to relocation of their senior and infirm sisters and to suggest ways of working together to address these issues. Through conversations, relationships developed and a dream that became foundational to The Sarah Community's Mission was shared. Soon others joined the conversation and collaboration began. From the beginning, this endeavor was Spirit led providing opportunities for residents to thrive as their needs are met by caring and compassionate staff. In 1997, The Sarah Community was founded by The Daughters of Charity of St. Vincent de Paul, Franciscan Sisters of Mary, Society of the Sacred Heart, School Sisters of Notre Dame, and the Sisters of Loretto. 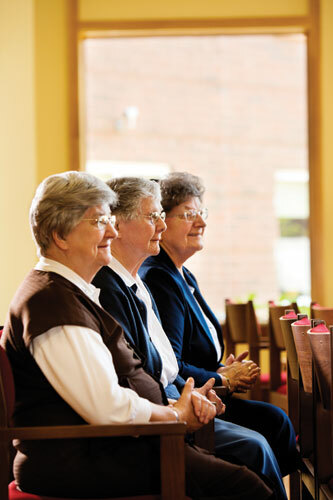 Together, the Sisters of these five congregations established a community where respect, compassion and a spirit of welcoming hospitality are key elements in meeting the retirement needs and providing long-term care to their members and the general public. Ours is a welcoming, faith-based residence for retired adults where they can continue their personal and spiritual growth. We have a wonderful combination of women religious and lay people. We share life and help each other as a close-knit group.